Lyle Fitzsimmons over at Boxing Scene.com has a provocative piece about the state of women’s boxing. Entitled “Reading the Reactions: What Matters, What May Never,” his thesis is that despite great strides in women’s boxing and his own personal hucksterism, if he judges support for the sport based on reactions to his columns it barely registers as a blip on the screen. Given the momentum of a steady increase in positive press, such phenomenal fights as the recent Torres vs. Nava battle and the fact that women boxers are filling the seats with paying customers at stadiums and other venues all over the world, Fitzsimmons’ prognosis is depressing indeed. Perhaps part of the problem is that here in the United States it’s hard to see a women’s bout unless one is willing to watch small market presentations, streaming-video on a laptop or after the fact YouTube videos. I mean lets face it, when was the last time HBO, Showtime or Friday Night Fights bothered to put a women’s bout on the air? 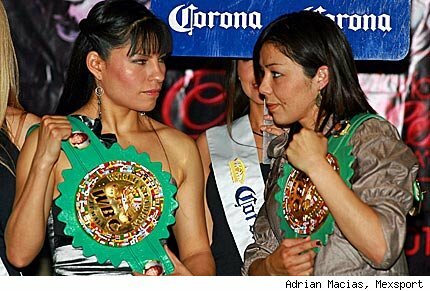 In HBO’s defense, at least they’ve had women’s bouts on their two most recent undercards! There’s also the issue of breaking through the “novelty” aspects of the sport that continue as an underlying current in mainstream discussions of the women’s boxing. Meanwhile, phenomenal female fighters in the amateur and pro-ranks continue to ply their trade with hard work and a sense of mission that sees them moving forward no matter the vitriol that is thrown their way in comment boxes across the internet or, as in the case of Fitzsimmons’ thesis, a lack of interest all together. Even given that I am biased by Girlboxing’s support of the sport, the butts in the seats seem to tell a different tale as a world-wide phenomenon, and while Fitzsimmons laments that the coming 2012 Olympics are a ho-hum moment to his readers, I would posit that given how far the sport has come in less than 20 years is something to spur optimism for its future. I know I keep harping on this one, but that fact that there is an Afghan Women’s Boxing Team at all sends the message that this sport is not going away, and despite the purported lack of interest among fanatical fans with nothing better to do than opine as to the prospects for the upcoming Pacquaio-Mosely fight, Philippine Pac-women fill the house as did Ana Julatan, the great Philippine-American fighter in her recent main event championship bout in Riverside, California. 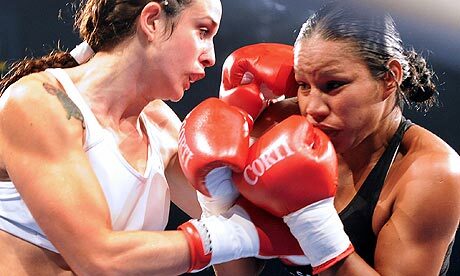 Women’s boxing is not going away — and whether there is ever another women’s championship bout on one of the major outlets or not, it is still seen and supported by serious fans of the sport throughout the United States — and in terms of the international embrace of the sport is regularly televised as mainstream national events with huge support from the sports establishment, especially in places such as Mexico, Argentina and Uruguay. Again, ticket sales don’t lie and seats are being sold — and even if Fitzsimmons’ readers don’t “get it,” the sport is evolving with new generations of fighters crossing the ropes and putting their hearts and souls on the line to make their way as boxers if for nothing else, than for love of the sport. Your site keeps me informed and up to date, and keeps reminding me to push womens boxing at every opptunity. Thanks so much for that. I do feel passionately about the sport and get angry when the sport doesn’t get the respect it deserves. With trainers such as you, however, the future of women’s boxing is in good hands. As well, your blog can only help in keeping the momentum going! Thanks again!